Oakland resident Nik Sharma is a man of many talents. In his new cookbook, with its 100 wonderful recipes, you learn the fascinating story of his life, which begins in India. On coming to the United States, he studied molecular genetics in the Midwest, held research positions on the East Coast, spent time in the Deep South, and finally came out West. Throughout this peripatetic life, his love of food has remained a constant. Sharma started his award-winning blog, A Brown Table, as a creative outlet to share and explore his interest in flavorful food. His cookbook tells a very personal story of his journey as a gay immigrant and the creative, innovative ways he’s combined foods and flavors of his two worlds, India and America. With beautiful photographs throughout, the book is special for the way Sharma reinvents familiar dishes. He spices up meat loaf with ginger, garam masala, and other spices, adding ground dried unripe mango and jaggery for sweetness. Chicken noodle soup he flavors with dried lime. A ginger-lentil-millet bowl appears as a quick, easy vegetarian supper. And there’s a delicious masala chai apple cake. You’ll want to read this cookbook front to back, and then go back and prepare every recipe. My husband, Michael, grew up on a farm in the Deep South, and he taught me to love fried chicken. But I learned to make this dish from our dear friend Raina Pearce, who always shakes the chicken (or even shrimp) in small batches in resealable plastic bags to get a uniform coating of flour. Her method has never failed me. In a blender, combine the remaining toasted spice mixture with the buttermilk, serrano chilies, scallions, 15 of the curry leaves, the garlic, 1 teaspoon of the cayenne, the ginger, lime juice, and 1 tablespoon of the salt. Pulse until completely smooth and transfer to a large resealable plastic bag. Pat the chicken breasts dry with paper towels. Trim excess fat from the chicken, and cut the flesh into 1-inch cubes. Add to the marinade. Seal the bag and shake to coat evenly. Refrigerate for 4 hours. Meanwhile, prepare the dredging mixture. In a large resealable plastic bag, combine the remaining half of the ground spice mixture with the flour, baking powder, baking soda, remaining ½ teaspoon cayenne, and remaining 1 teaspoon salt, shaking vigorously to blend. Finely chop 10 of the remaining curry leaves and add them to the dredging mixture. Seal the bag and shake again to mix well. Once the chicken has marinated, use tongs to lift out half the chicken pieces, shaking off the excess batter, and transfer to the bag with the dredging mixture. Seal the bag and shake to coat evenly. Transfer the chicken pieces to a wire rack. Repeat with the remaining chicken. In a medium Dutch oven, heat the oil over medium-high heat to 350°. Fry the chicken in batches, turning occasionally, until golden brown and cooked through, 4 to 5 minutes. Using a slotted spoon or a spider, transfer the chicken to paper towels to drain. After the chicken is cooked, prepare the garnish: Cut the Thai chilies in half lengthwise. In the hot oil left in the pot, deep-fry the chilies and remaining 5 curry leaves until crispy, 30 to 40 seconds. Drain on paper towels. Put the chicken on a serving plate, garnish with the chilies and fried curry leaves, and serve hot with the maple-vinegar sauce or hot sauce. Whenever I make popcorn chicken or fry larger serving pieces, I flavor the dish in stages. The whole spices are toasted to activate their oils. These are then blended into buttermilk to create a savory marinade. More seasoning is then added to the flour in the dredging mixture, and finally, the hot little nuggets of chicken are topped with crunchy fried curry leaves and chili peppers. While we often eat this with a hot sauce or ranch dressing, the very best accompaniment is the maple-vinegar syrup or green chutney. In India, especially in the north, ghee is used to cook almost everything—including desserts. We even like to fry nuts and raisins in ghee to garnish kheer (a rice pudding). Elderflower cordial adds a floral note to this highly aromatic cake. Serve with a dollop of sweetened crème fraîche and fresh berries. Preheat the oven to 350°. Grease a 9-inch round cake pan with a little melted ghee and line with parchment paper. Brush the parchment paper with a little more ghee. Sprinkle the jaggery on the bottom and sides of the pan, rotating the pan to coat evenly. In a medium bowl, whisk together the flour, baking powder, and salt. In a large bowl, whisk together the 1 cup ghee and sugar until you get a smooth slurry. Whisk in the eggs, one at a time, until well combined. Add half the dry ingredients and whisk until smooth. Whisk in all of the milk, and then the remaining dry ingredients, whisking until the batter is smooth and there are no visible streaks of flour. Transfer the batter to the prepared pan and level the surface with a small offset spatula. Bake for 45 to 50 minutes, rotating the pan halfway through baking. Remove the cake from the oven and cool in the pan on a wire rack for 5 minutes. Run a knife around the inside of the pan to release the sides of the cake. Invert the cake onto a serving plate, gently tapping the pan to release the bottom. Let the cake cool for another 5 minutes, and then carefully peel off the parchment paper. Cool to room temperature. Brush the cake generously with the elderflower cordial and let sit for another 10 minutes to absorb the liquid before serving. Store leftover cake, wrapped in parchment paper and aluminum foil, for up to 4 days at room temperature. Ghee is prepared by boiling off the water in butter and caramelizing the milk solids. The fat and the jaggery flavor the cake as it bakes. 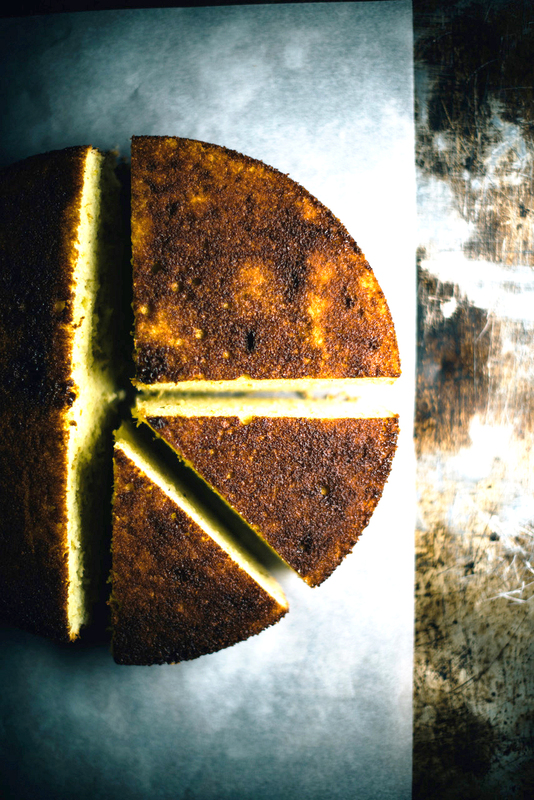 If you want to make the cake a little boozy, you can replace the cordial with an elderflower liqueur, such as St-Germain. Alternatively, add ½ teaspoon ground cardamom to the batter. Line a strainer with a few layers of cheesecloth and place over a clean, dry 1-pint jar with a tight-fitting lid to hold the finished ghee. Set aside. In a heavy, medium saucepan over medium-high heat, melt the butter, stirring occasionally with a large metal spoon. As the butter starts to melt, skim off and discard any foam that rises to the surface. Cook until all the water in the butter boils off and the fat stops sizzling and turns a deep golden yellow. The milk solids at the bottom of the saucepan will be reddish brown. The entire process should take 12 to 15 minutes. Remove the saucepan from the heat and carefully pour the liquid through the cheesecloth-lined strainer into the jar. Seal the jar and store the ghee in a cool, dark place for up to 3 months, or indefinitely in the refrigerator.